Attorney General Bill Schuette is asking for a promotion in 2018. But Schuette’s record is clear: Schuette is only on-duty for special interests and political insiders. 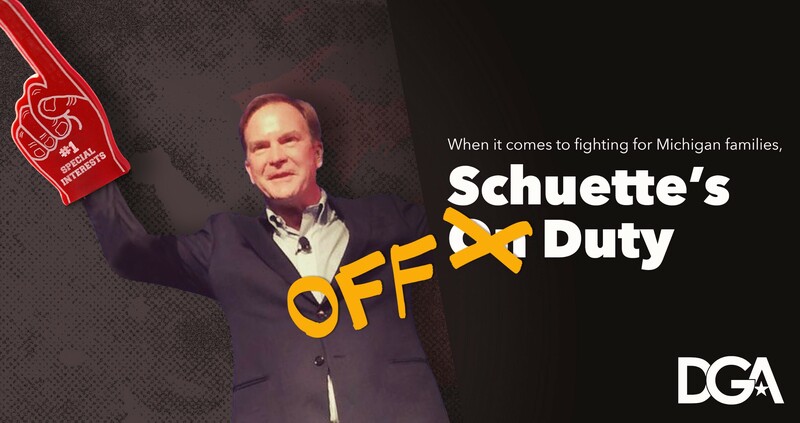 When it comes to fighting for Michigan’s working families, veterans and students, Bill Schuette’s off duty. Bill Schuette has the wrong priorities for Michigan. Under Schuette’s watch, the Flint water crisis spiraled out of control. Schuette’s office signed off on a key environmental order that switched Flint to a contaminated water supply. Then, Schuette dragged his feet on investigating the crisis, delaying the process for months. When the people of Flint needed him, Schuette was off duty. Bill Schuette fought to allow Michigan to slash $4 million from the Grand Rapids Home for Veterans. As a result, the home was understaffed, the quality of care declined, and cases of abuse and neglect were covered up. When Michigan veterans were suffering, Schuette was off duty. Bill Schuette was elected as Attorney General on a promise to protect Michigan taxpayers’ dollars. Instead, he frittered away taxpayer dollars on wasteful political lawsuits in attempt to advance his own political career. Michigan editorials wrote that Schuette was “wasting the state’s energy and resources” on partisan lawsuits, turning the Office of the Attorney General “into a lobby for partisan causes.” When it comes to protecting Michigan taxpayers, Bill Schuette was off duty. Democratic Governors Association. Electing Democratic governors since 1983.